On Motoring Exposure, we are discussing Sinn Spezialuhren’s method of exhaustive testing, using a German research center (Fraunhofer Institut für Betriebsfestigkeit und Systemzuverlässigkeit) that works on issues raised by automobile and commercial vehicle branches. 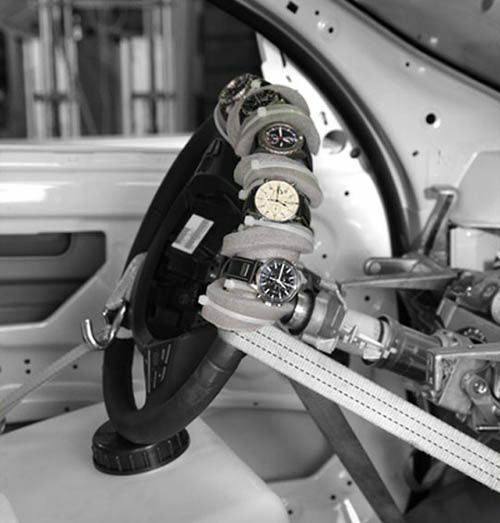 As you can see above, the insitute attached 5 Sinn watches to the steering wheel and put the simulation car to exhaustive testing methods. This way, you’ll know that your Sinn chronograph watch is capable enough for the job when you are hitting the streets like Steve McQueen in Bullit. Click here for my article over at Motoring Exposure.